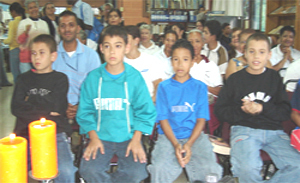 The wonderful audience of our recital at the library of Santa Cruz, a Medellín neighbourhood. 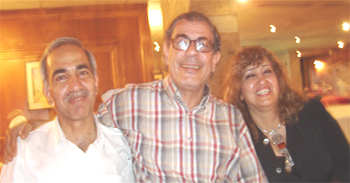 Poets Adnan Al-Sayegh (Iraq), Hilmi Salem (Egypt), Maisoon Saker Al-Qassimi (United Arab Emirates). 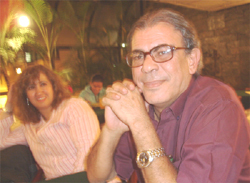 Poets Maisoon Saker Al-Qassimi (UAE) and Hilmi Salem (Egypt). 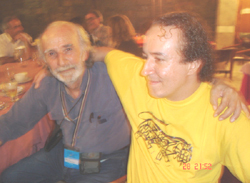 Poets Anwar Al-Ghassani (Iraq) and Luis Eduardo Rendón chief festival coordinator (Colombia). 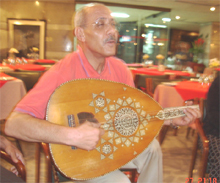 Poet Idris Tayeb (Libya) playing on his Ud during a singing session of the group of Arab poets. Poet Joumana Haddad (Lebanon) and my dear friend poet Enrique Hernández-D´Jesús (Venezuela). From left to right, poets Anwar Al-Ghassani, Adnan Al-Sayegh (Iraq), Maisoon Saker Al-Qassimi (UAE), Ali Al-Shalah (Iraq), Malak Mustafa Sahioni (Syria), Dorin and Alina Popa (Romania). 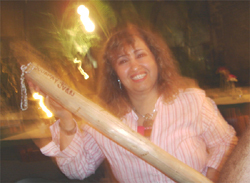 Poet Maisoon Saker Al-Qassimi (UAE) playing with a hollow trunk with seeds in that produce a musical noise. 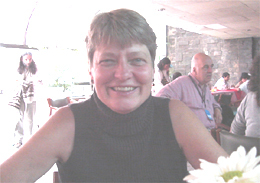 Poet Di Brandt (Canada). In the background poet James Fenton (UK). 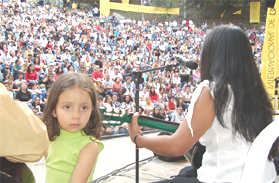 Around 5000 persons attended the festival´s marathon closing ceremony of six hours on July 2, 2005. 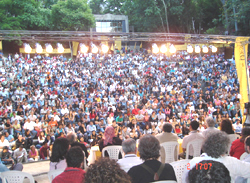 Poets Idris Tayeb (Libya), Layla Al-Sayyed (Bahrain) and Adnan Al-Sayegh (autographing). 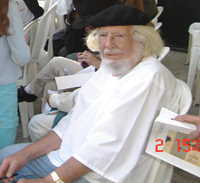 Poet Ernesto Cardenal (Nicaragua). 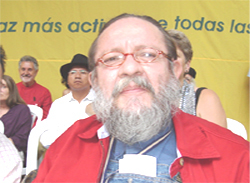 My dear friend poet, photographer and graphics artist Enrique Hernández-D´Jesús (Venezuela). In the Background poets Ariruma Kowii (Ecuador) and Breyten Breyetenbach (South Africa).